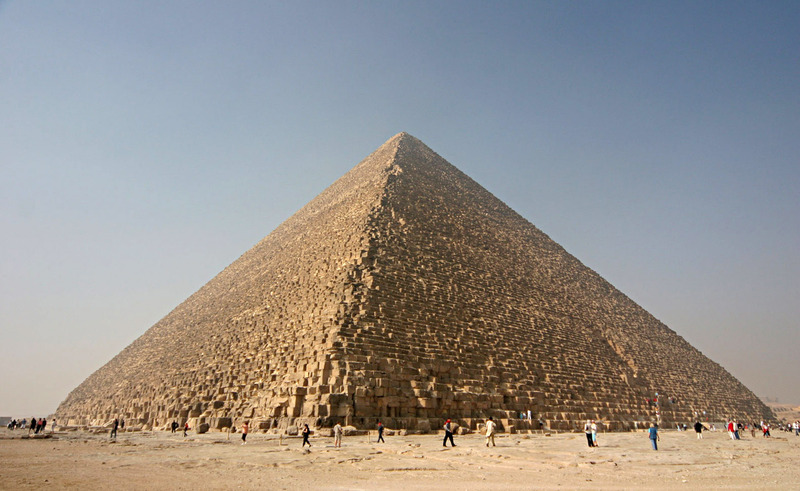 are the pyramids of Egypt, and of all the pyramids, the Great Pyramid of Giza is the one usually the one that comes to mind as a prime example of these magnificent structures. In my view, these are just complete sideshows to some truly remarkable human history. These large structures have endured over the eons of human civilization and remind us of our ingenuity, persistence and, of course, the fleeting existence of a particular culture. There aren’t Pharaohs anymore, but there are pyramids, and the can be studied from the comfort of you desktop computer. Its a good way visualize the concept, but once they understand how to do the calculations, why not take out into the real world of archaeology and do some real world calculations? The pyramids on Google Earth work really well if you are so inclined. First, Google has excellent high resolution images of these famous objects and they easy to locate. As always you get the additional value of geographical knowledge, and once at the location students can do some meaningful measurements using Google Earth measurement tools. They too are easy to use. Looks like an nice square to me. So, it’s easy to find each corner and measure. In this case, I chose to use meters, but there are many different units one could choose. To make this even more interesting, students can compare their results with those collected in archaeological studies. Like most of my Google Earth activities, I direct all of the student work with a KMZ file. In this case, I embed google forms which students use to record their results and which captures their answers for assessment. If you don’t want to work with forms, an advance organizer on paper which allows them to enter data and do calculations is quite handy. I also provide a link to known archaeological data so they can compare their results to the highly precise measurements done by surveyors at the site. Turns out the students can get pretty close to the results by the experts. There are many other connections on could make. Volume calculations come to mind and it would be interesting to compare the footprint(area) of the Great Pyramid to a modern building or other historical buildings. Students also have to put their addition skills to good use. I require them to measure to the nearest 1/100th of meter, which fits well with the math skill set to which they have been introduced. To download resources you might want to use for this lesson, just click below. Of course you can’t use my forms, but you can can make a copy of the advance organizer and download the GPC KMZ file as an example and modify it for your own use. There’s also a KMZ file that gets the students to the Pyramid and locates the corners.